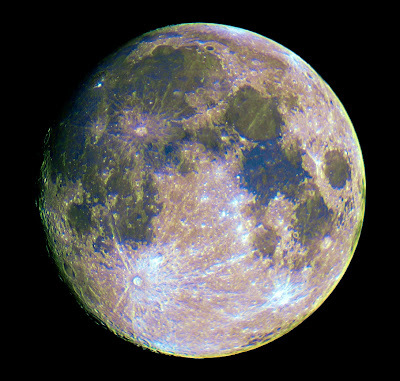 A remounted WB5400 1.3MP webcam, fitted with an IR/UV cut filter was placed at the prime focus of an f/5.5, 80mm ED refractor, set to maximum saturation for capture and 5050 AVI frames of the Lunar disk were captured. The AVI was processed in Registax to produce the final image. Click on the image to get a larger view. The colour saturation was increased slightly to reveal the differences in surface mineralogy. 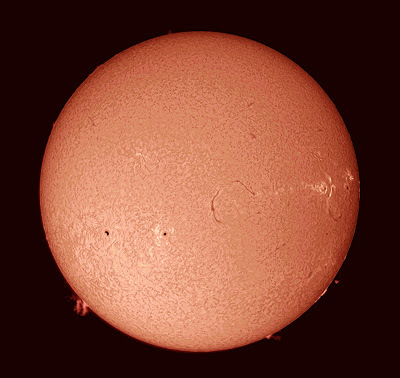 An Opticstar PL-130M monochrome, 1.3MP CMOS USB camera fitted with stacked neutral density filters and a Baader IR/UV filter was placed at the prime focus of an f/5.5, 80mm ED refractor. A 6240 frame AVI was captured of the whole lunar disk at a resolution of 1280 x 1024. The AVI was processed in registax and the best 90% of the frames was stacked to give the final image. An Opticstar PL-130M monochrome, 1.3MP CMOS USB camera fitted with stacked neutral density filters and a Baader IR/UV cut filter was placed at the prime focus of an f//5.5, 80mm ED refractor. A 3381 frame AVI was captured of the whole lunar disk at a resolution of 1280 x 1024. The AVI was processed in registax and the best 85% of the frames were stacked to give the final image.